Recommended for residential or small businesses environments. 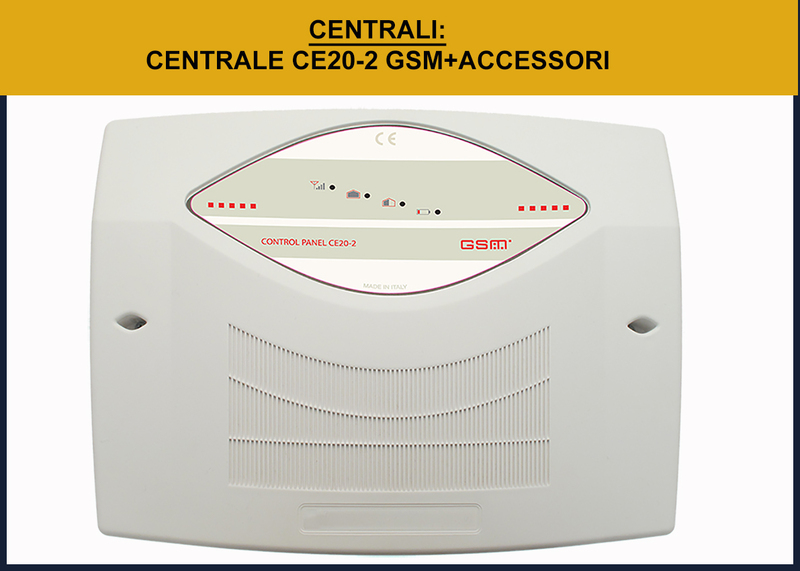 20 zones for wireless sensors + 2 rows board zones, up to 10 radio activators, GSM dialer (8 telephone numbers) to send SMS or voice calls, siren on board, mains or battery, activation mode with radio and / or remote control keypad inserter / disengaging, SMS or Smartphone app for Android-IOS. 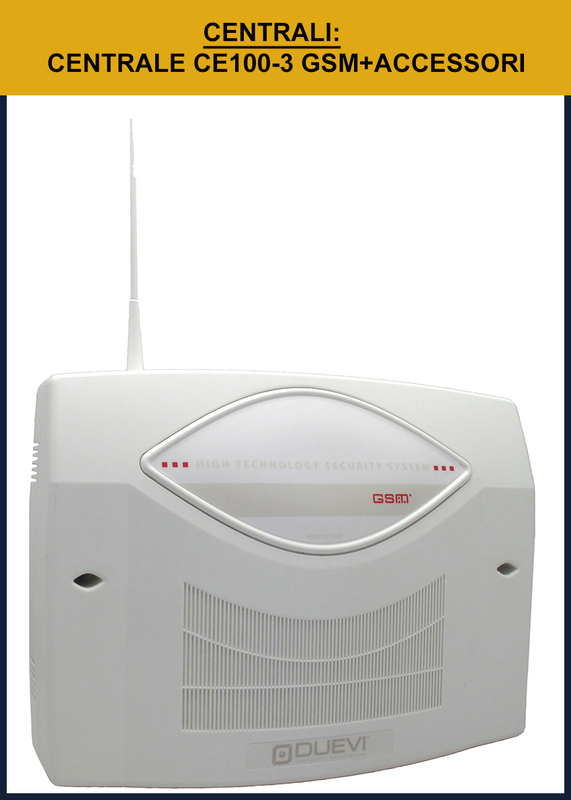 Radio-wire Mixed alarm system for the protection of small areas. It consists of an alarm control panel with built-in flashing sirens. Connecting up to 6 wireless zones and 1 wired to relay output to switch on lights or telephone dialer to call in case of intrusion. 9-volt battery supply (included) but supports an external power supply 9 voltdc. Arming / disarming with TXS-M remote control. 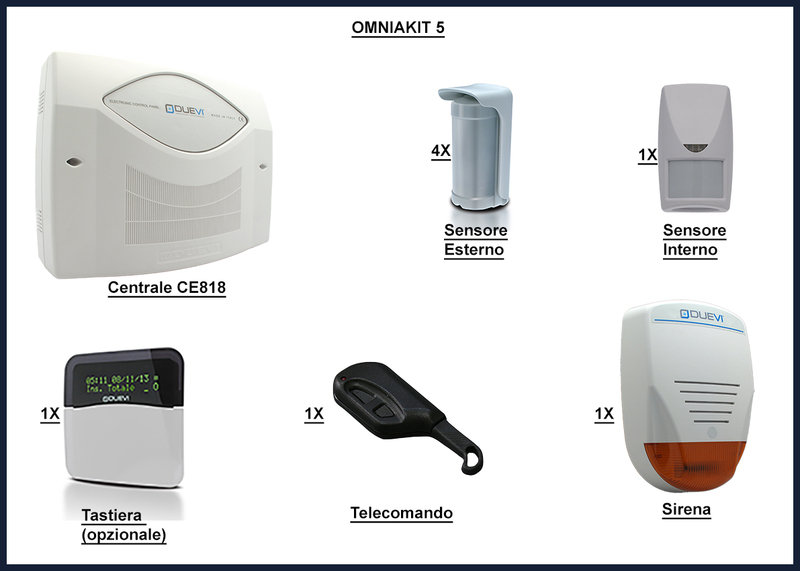 Intruder alarm system consists of a central, 4 external sensors, 1 internal sensor, 1 siren, 1 remote on / off, 1 sound module for voice communication (30) in case of alarm. 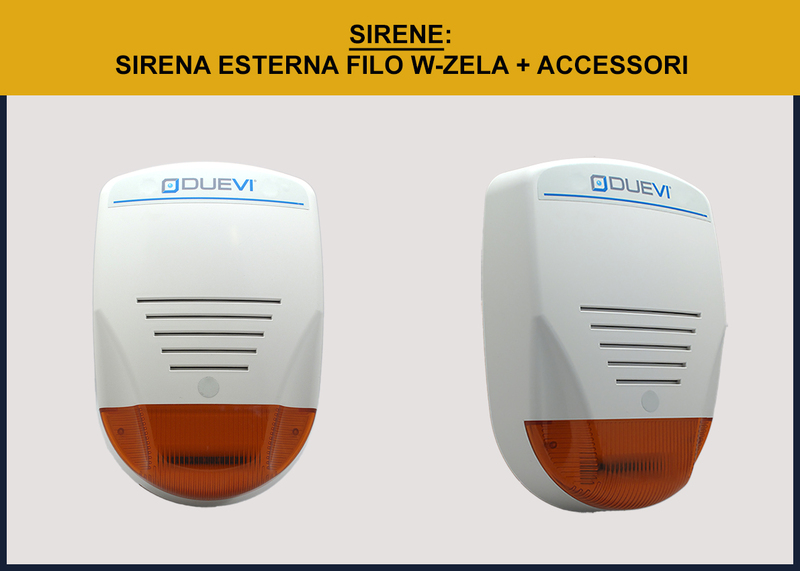 Particularly suited to detecting intruders in the property (garden, yard, patio, terraces) for external sensors detect any movements of strangers as they enter into the property and warns those in the house. Even if you have large grounds surrounding the house you will feel safe! The center is equipped with the integrated GSM telephone dialer to call and SMS with 8 programmable numbers for: alarm, panic, remote alarm, power status, and of course voice calls on your mobile and / or fixed telephone. 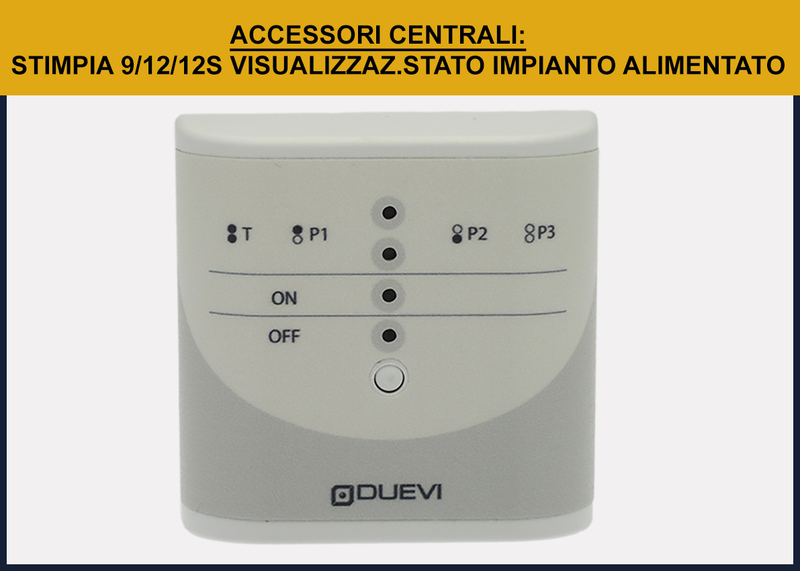 INTRUSION ALARM SYSTEM consists of a central, 4 external sensors, 1 internal sensor, 1 siren, 1 remote on / off, 1 control keyboard, to be installed in a strategic position, 1 sound module for voice communication (30) in case of alarm. Particularly suited to detecting intruders in the property, garden, yard, patio, terraces, sensors to detect any external movements of strangers as they enter the property, even a few cm, thus putting in alarm those who are in the house. Even if you have large grounds surrounding the house you will feel safe! The center is equipped with the integrated GSM telephone dialer to call and SMS with 8 programmable numbers for: alarm, panic, remote alarm, power status, and of course voice calls on your mobile and / or fixed telephone and much more. 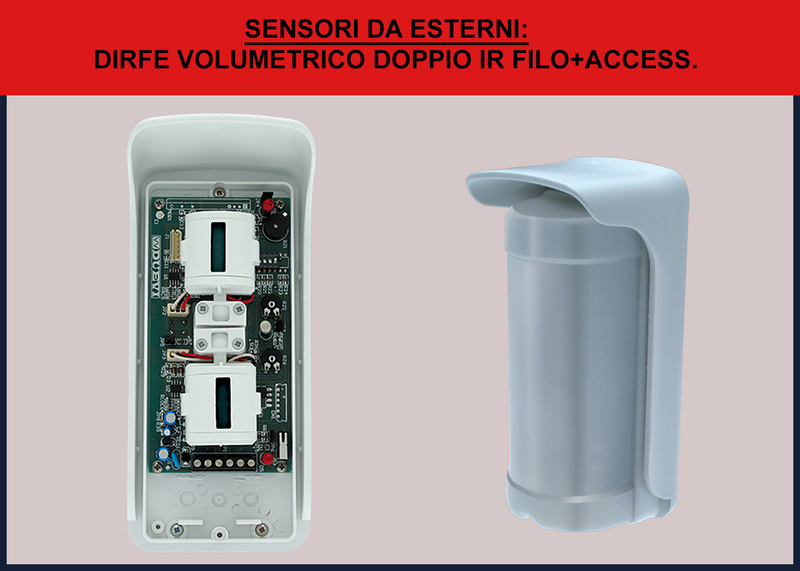 WIRE INTRUSION ALARM SYSTEM consists of a central, 4 external sensors, 1 internal sensor, 1 siren, 1 remote on / off, 1 control keyboard, to be installed in a strategic position. 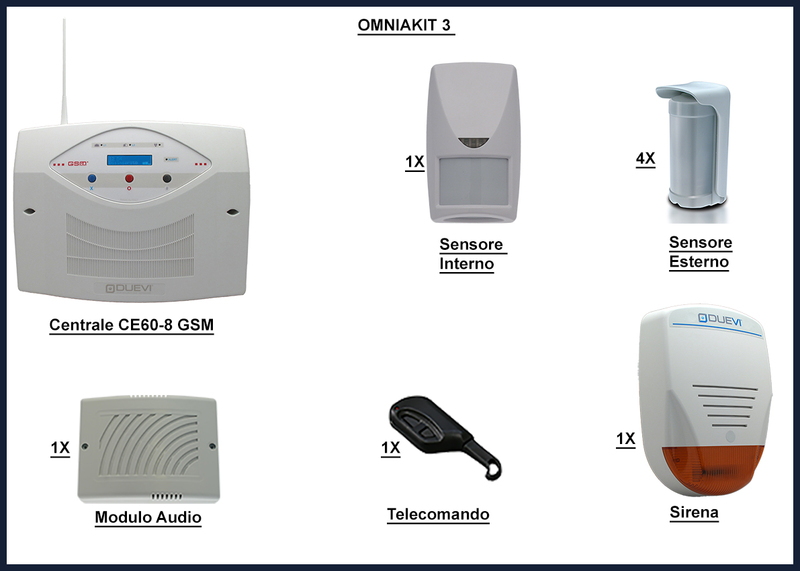 INTRUSION ALARM SYSTEM wire/radio consists of a central, 4 external sensors, 1 internal sensor, 1 siren, 1 remote on / off, 1 control keyboard, to be installed in a strategic position. Even if you have large grounds surrounding the house you will feel safe! The center is equipped with the integrated GSM telephone dialer to call and SMS with 8 programmable numbers for: alarm, panic, remote alarm, power status, and of course voice calls on your mobile and/or fixed telephone and much more. 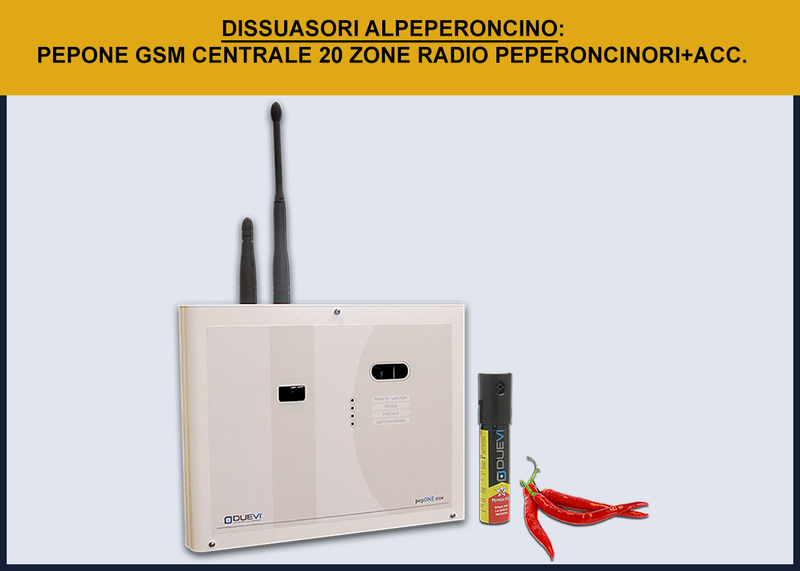 20 zones for wireless + 2 wired sensors - up to 10 radio activators delays input / output 30 sec. reg. 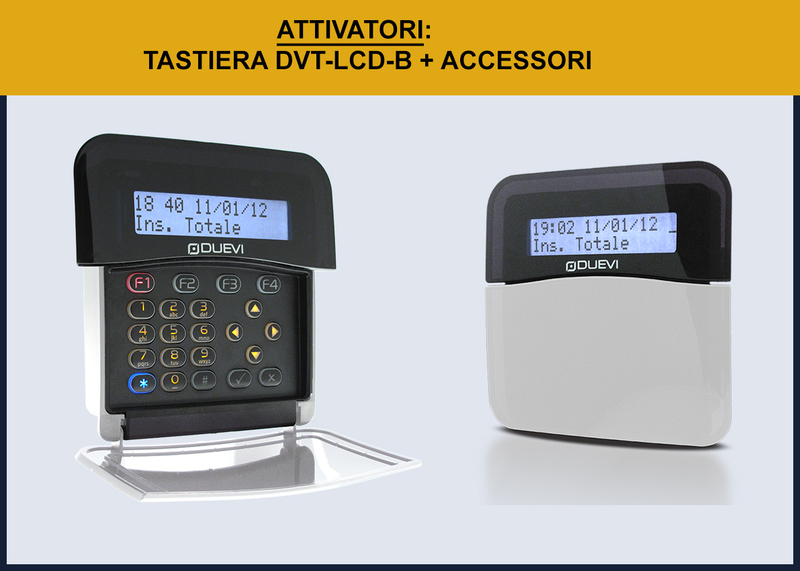 2 modes of activation (1 + 1 total partial) via wireless keyboard, remote controller, SMS or App. Built-in GSM dialer (8 telephone numbers) to send SMS and / or voice messages. Siren and radio and antenna integrated into GMS. Available in version powered battery or 220V mains supply. Section GMS programmable via PC software and transfer PenDrive. 325x250x90mm dimensions. 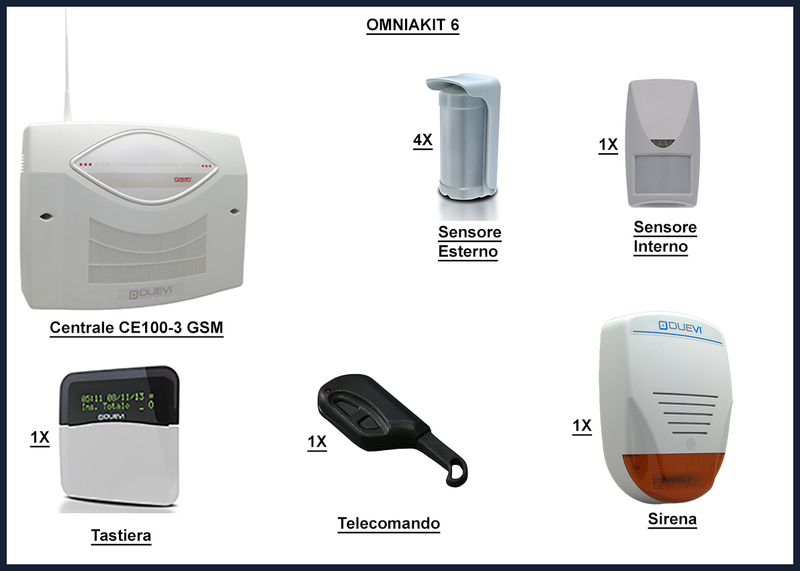 Complete range of outputs for sirens and other dispositive GSM dialer (8 telephone numbers) for sending text messages and / or user-recordable voice calls sending events Contact ID ( SIA-DC09) through GPRS data networks to remote management Duevi alarm receivers IP App for Smartphone Android and IOS environmental listening from remote siren on board USB port for programming via Software for Windows. 100 zones for wireless sensors + 3 zones rows on board (expandable to 35 via ESP-2 module with an RS-485). 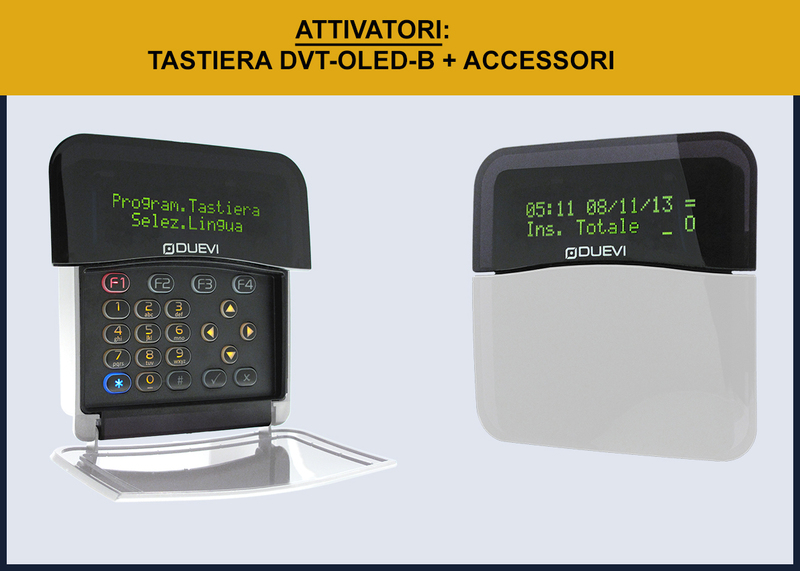 Complete management via external OLED keyboard (not included), up to 72 radio / wire activators, great flexibility for system customization. 4 activation modes (1 total + 3 partial) via wired / wireless keyboards, SMS, remote controls, proximity key, call with voice menu selection. Bus RS 485 interface for connecting expansion I / O, complete range of outputs for sirens or other external devices, 2 outputs for expandable auxiliary relays. GSM voice dialer on board (8 telephone numbers) for sending text messages (SMS) or user-recordable voice calls. Sending events Contact-ID (SIA-DC09) through GPRS data network to compatible IP receivers, complete remote management via SMS or voice call menu and DTMF tone dialing. APP Remote Management "Duevi Alarm" for Smartphone Android and IOS, memory 200 events, remotely listen-in. Thermostat function for remote boiler control via SMS. 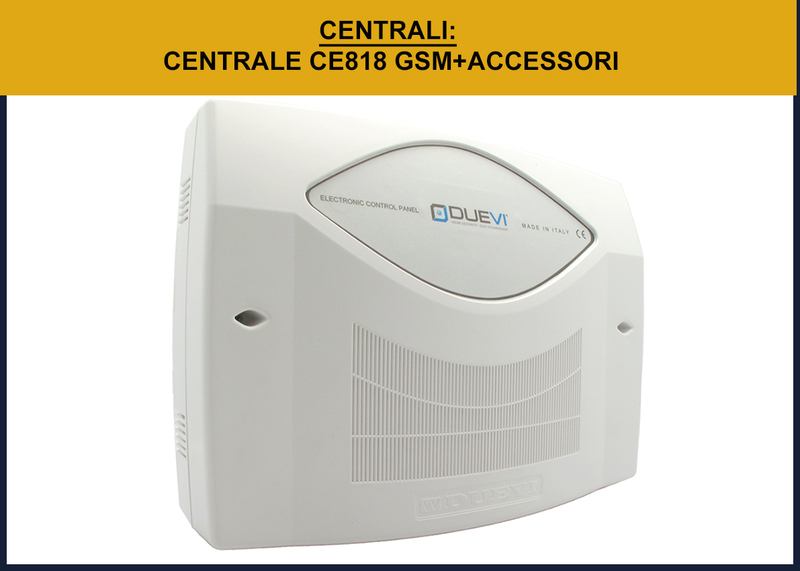 The central CE818 is unique allows you to choose between simple mode with relative plant or simplified with advanced range of more extensive functions of options. 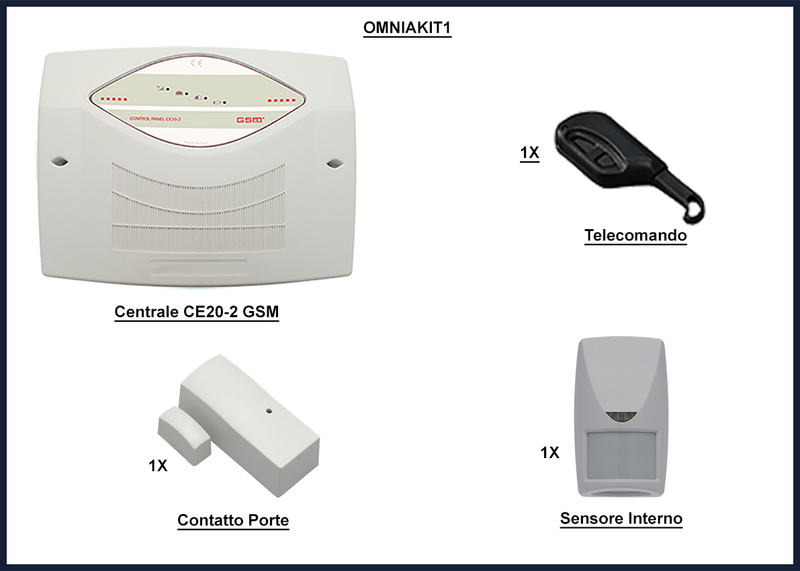 8 zone alarm wire, max 12 CH72 transponder keys, max 4 mod transponder readers Let-485, 1 arming + 1 entry. 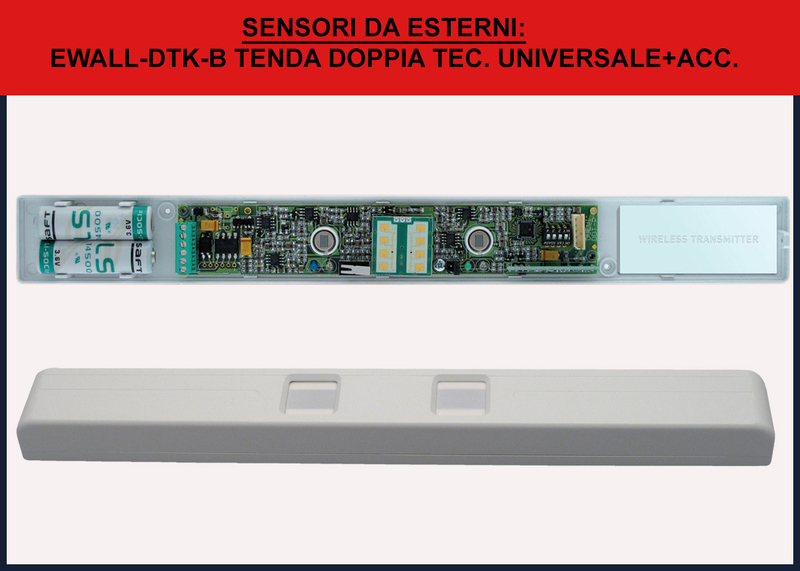 Entry/exit input delay (30 seconds), open door function with self-exclusion, programming with PC software and data transfer with Pendrive (Not included) directly to the USB socket on board. 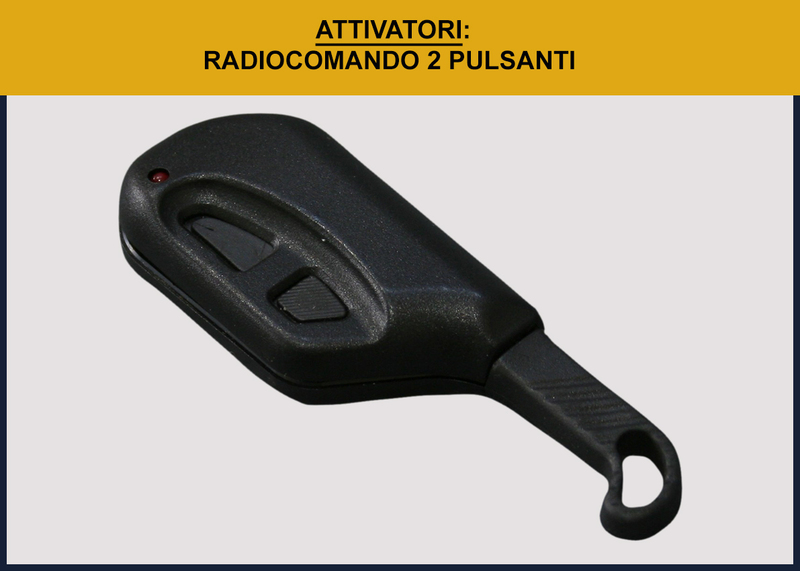 Radio control keypad to activate/partialization and deactivation of unit alarm central. Up to 8 user codes. Power lithium battery (included) 7.2v mod: BAT7V2SENS. Autonomy about 18 months with 10 activations per day. Wired keyboard connected via RS485 bus (4-wire) for programming and central control, power 12v dc. Dimensions: ca. 160 x 160 x 35 mm. Compatible for mod power plants: CE100-3GSM-BUS, CE818. READER for transponder key mod. CHT- W (without contacts) via bi directional radio activation/deactivation and partialization. Power supply 2 x 3V lithium battery CR 123A mod. OBT0001 included. Dimensions: ca. 123 x 88 x 30 mm. Flash high-brightness LED with signaling activation/deactivation facility. Dimensions: 310 (H) x 210 (L) x 85 (D) mm. W-ZELA-PROX version tamper with proximity sensor within 5cm. 1 alarm input, 1 pre-alarm input, 1 input system status. 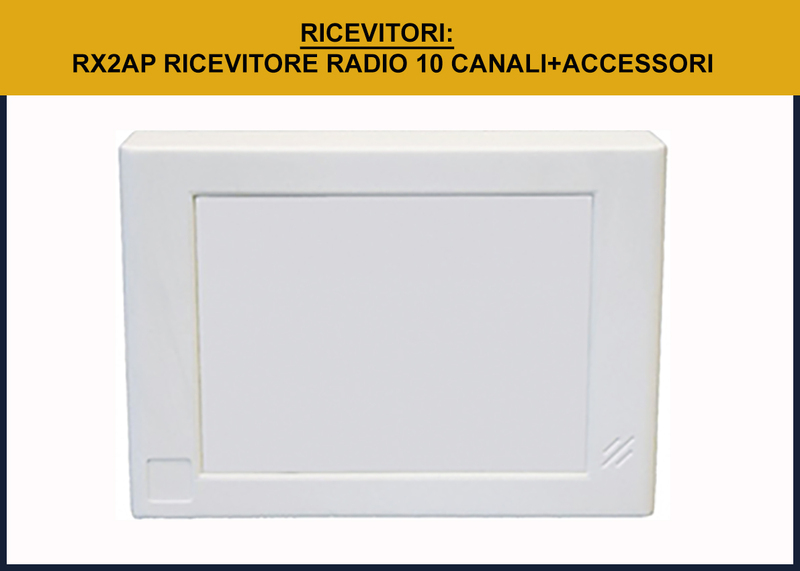 Full central alarm radio / wire with irritant gas supply. 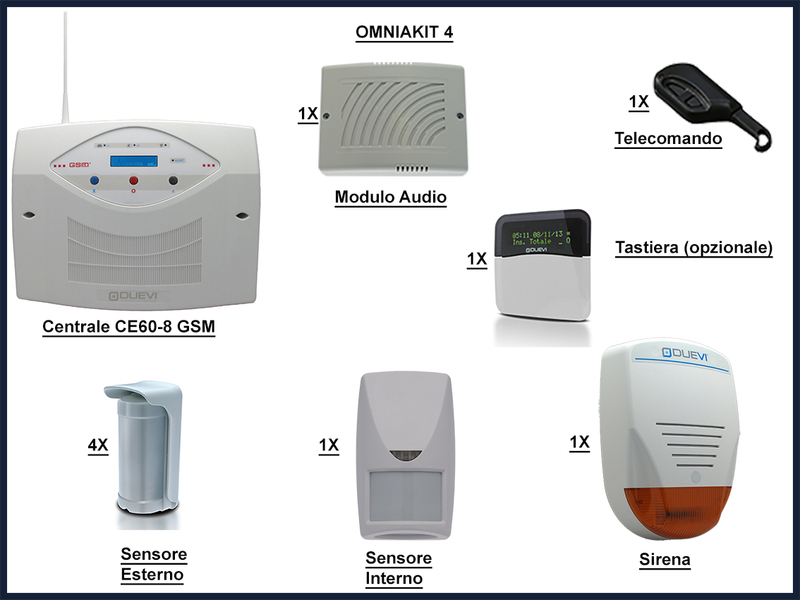 Wireless terminal (to 8 numbers) for sending SMS / voice messages and powerful siren on board, with deterrent system with atomized irritating gas supply up to 30 m.
20 radio sensors + 2 wired zones, 10 radio activators, activation mode 2 (1 TOTAL + 1 PARTIAL ACTIVATION) wireless keypad, remote controls, SMS messages or app "Duevi Alarm" for SmartPhones and iOS, URTICANT gas regulator included. 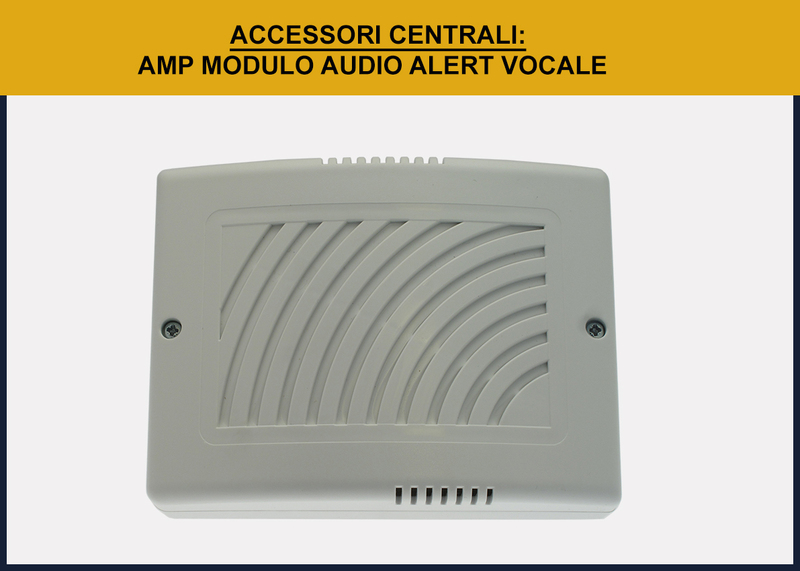 It has the important function of alerting via alarm pre-recorded message in case of fault (no closed doors or windows properly) or real intrusion. It covers the first 30 radio zones assigned. 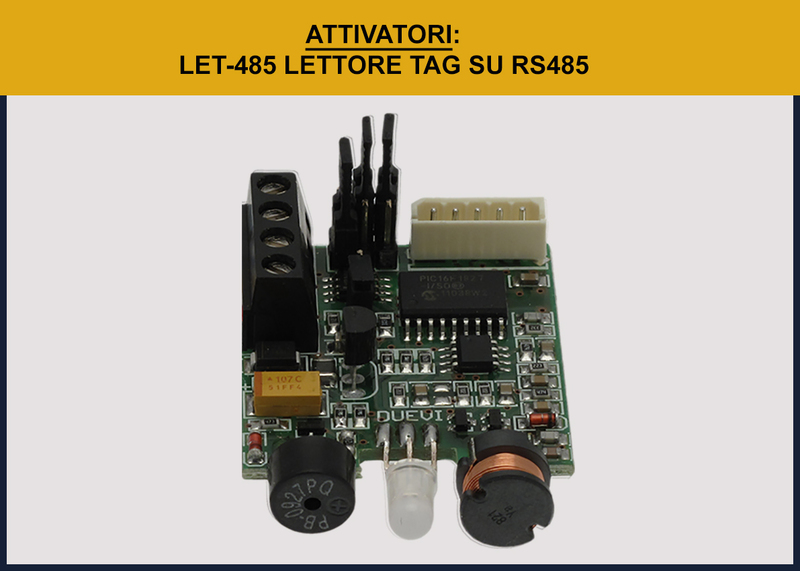 RS 485 bus mode with 8 telephone numbers for SMS sending and / or user preregistrabili voice calls. 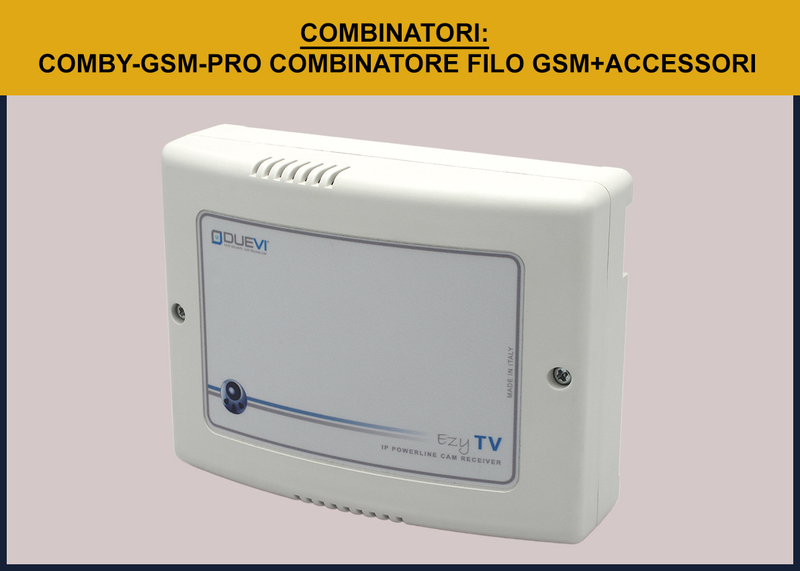 Combiner COMBY-GSM-PRO, with 8 telephone numbers for sending voice calls and / or SMS, bidirectional, 10 voice messages of preregistrabili alarm activation deactivation of each alarm input, 12 alarm SMS messages with user-customizable text, 5 programmable alarm inputs, management of remaining credit rechargeable SIM, GMS integrated antenna, integrated microphone and speaker for recording and playback voice messages, 12V dc power supply, 1 NiMH rechargeable battery 9.6V 600mA mod: BAT 9.6 not included. Indicates the status of the system by radio, with a glance it allows you to see if all the functions are in order. STIMPIA-9: compatible with all central control units, 9V power supply mod. BAT9 (not included). 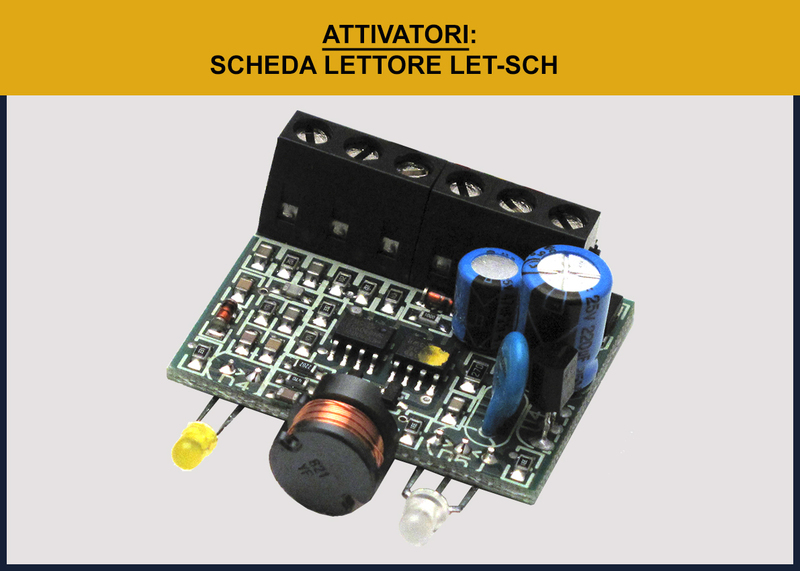 STIMPIA 12: compatible with all central control units, power supply 12V ac / dc not included (ALIM-dc power supply). STIMPIA: 12s: only compatible with the central CE60-8 by sectors, supply 12V dc / ac (ALIM-dc power supply). Mini -C radio contact quadruple protection. 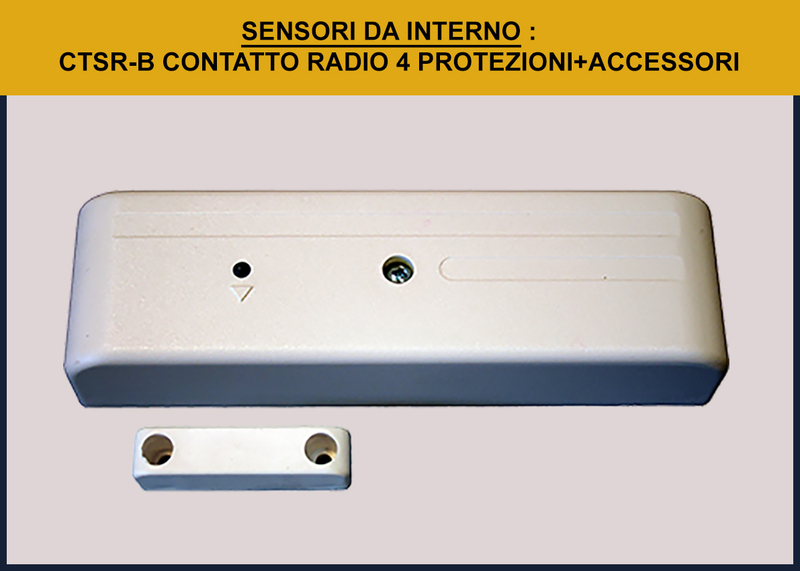 Magnetic contact for indoor radio with 4 protections (contact and shock sensor on board by external contact input, sensor input shutter or inertial with count 4 pulses), anti opening tamper and tear resistant, transmission closing for the opened door or window, low battery warning , distinct radio signal for the 4 surveys, recognized by Duevi central. Battery power 3V type CR23a included, autonomy 3 years ca. Alarms with 30 day/night. Dimensions: ca. 104 x 30 x 30mm. Available colors: white and brown. 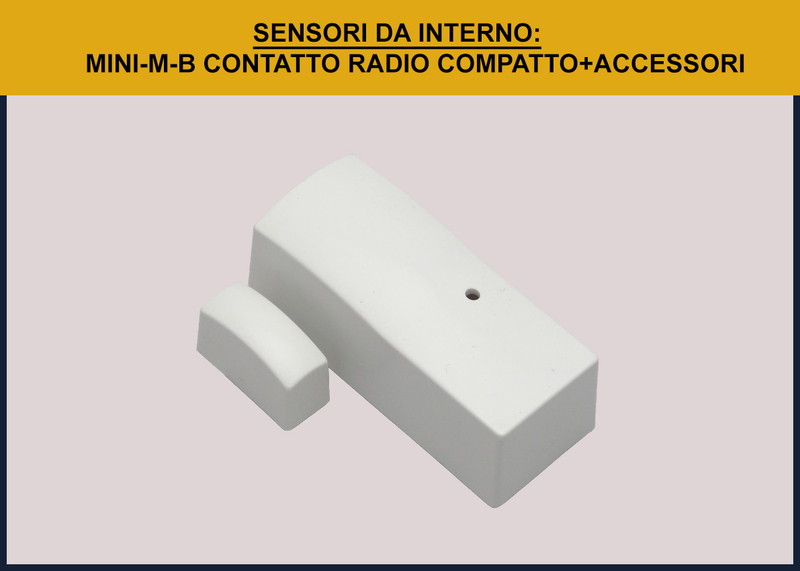 Magnetic contact via radio, antiopening tamper and tear resistant, transmission closing for open door, for low battery warning, possibility of positioning the magnet on two sides for increased mounting convenience. Wired input for external contact in parallel to a reed of the edge. Lithium battery power 3V CR2 included, operating time approx 2 years with 30 alarms a day/night. Dimensions: ca. 74 x 30 x 30 mm. 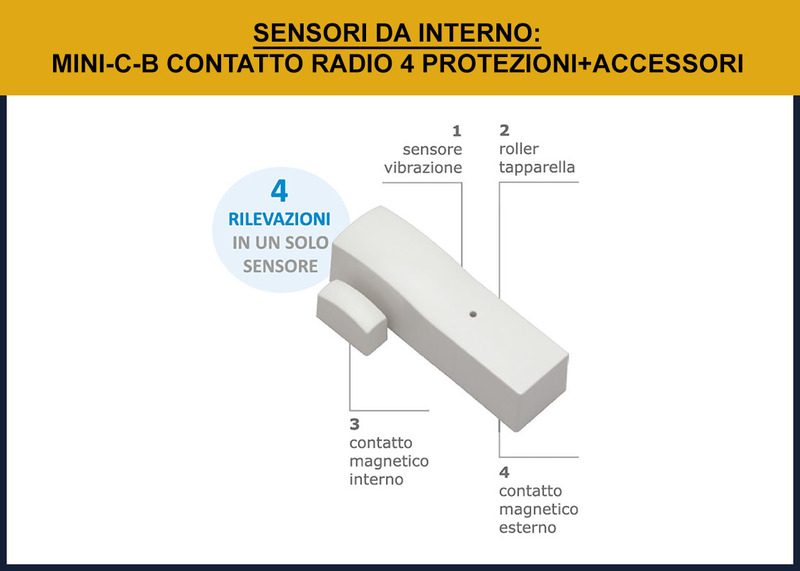 Magnetic contact for indoor radio with 4 protectons (contact and shock sensor on board by external contact input, sensor input shutter or inertial with count 4 pulses), antiopening tamper and tear resistant, transmission closing for the door or opened window, low battery warning , distinct radio signal for the 4 surveys, recognized by Duevi central. Dimensions: ca. 130 x 40 x 25mm. 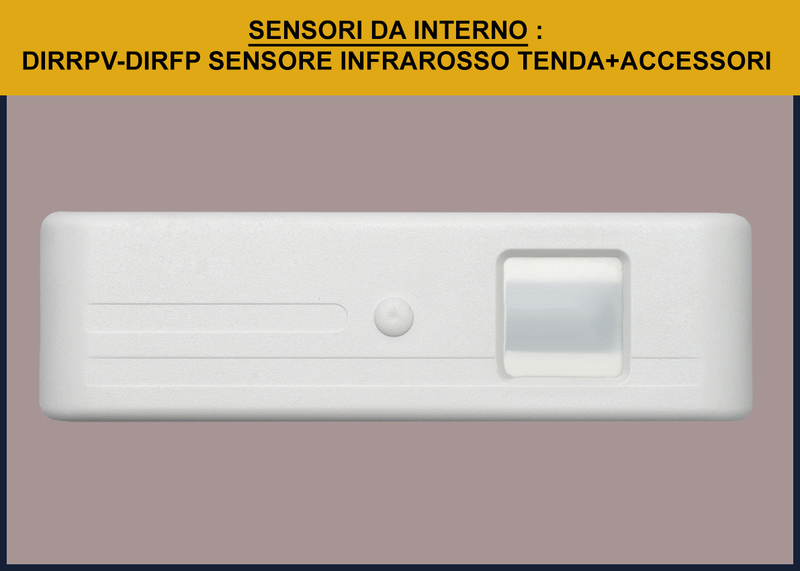 DIRRPV passive infrared sensor with lens effect tent by radio. Internal protection of doors and windows. Sensitivity adjustment. Self-protection tamper. Capacity ca. 2.5 m. Power 9V alkaline battery mod. BAT9 (not included), autonomy ca. 2 years. Dimensions ca. 130x40 x 25 mm. 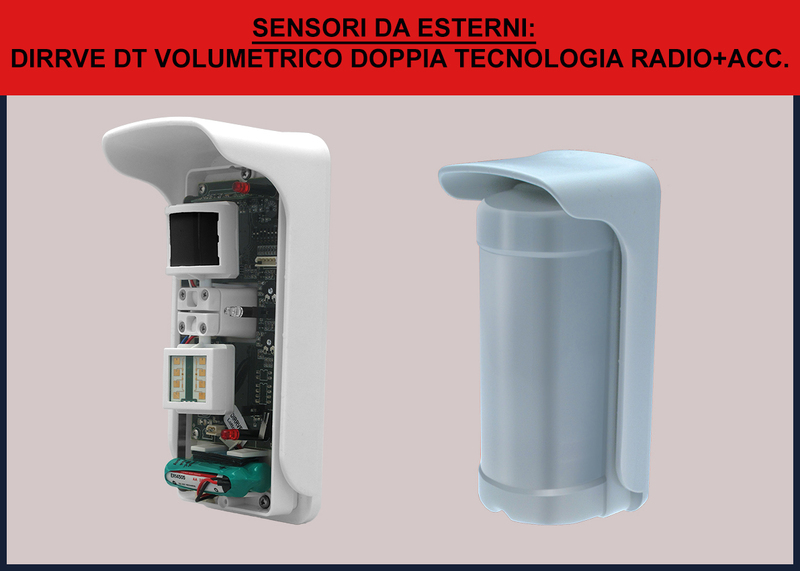 DSA is a sensor capable of detecting the flooding of an area, battery power, is positioned in the floor of the area to be monitored and is able to detect natural water rain water or demineralized. 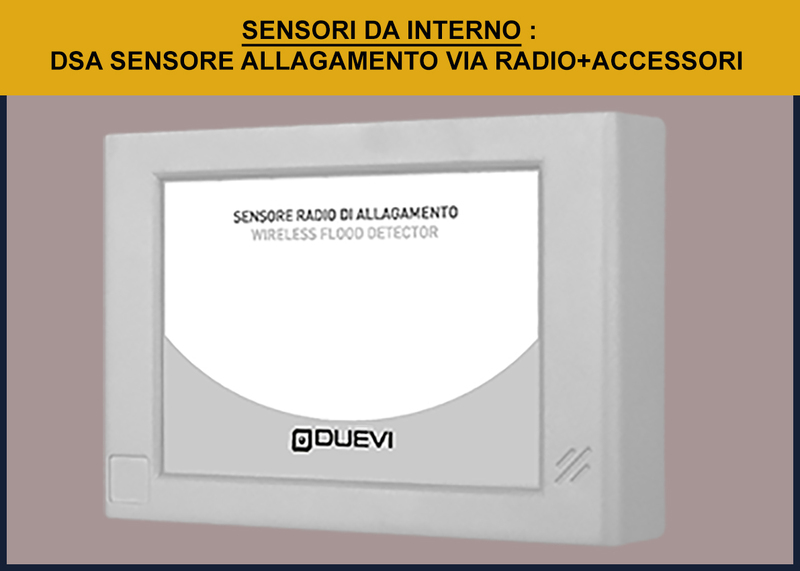 The presence of water on the floor it is immediately detected and the sensor transmits the signal via radio to the central alarm. The sensor sends the status of the battery and supervision. Mod BAT9 9V battery power (not included) and has a range of about 2 years. Dimensions ca. 123 x 88 x 30 mm. 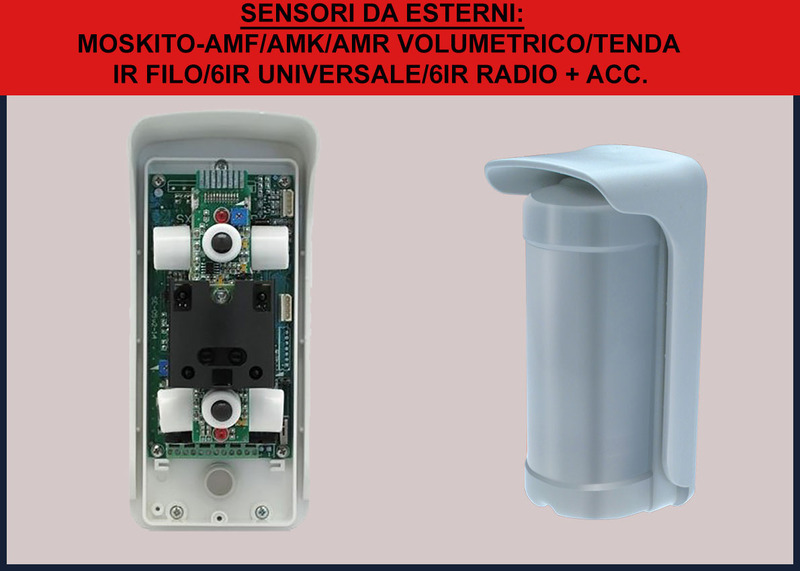 DSF smoke sensor via radio. 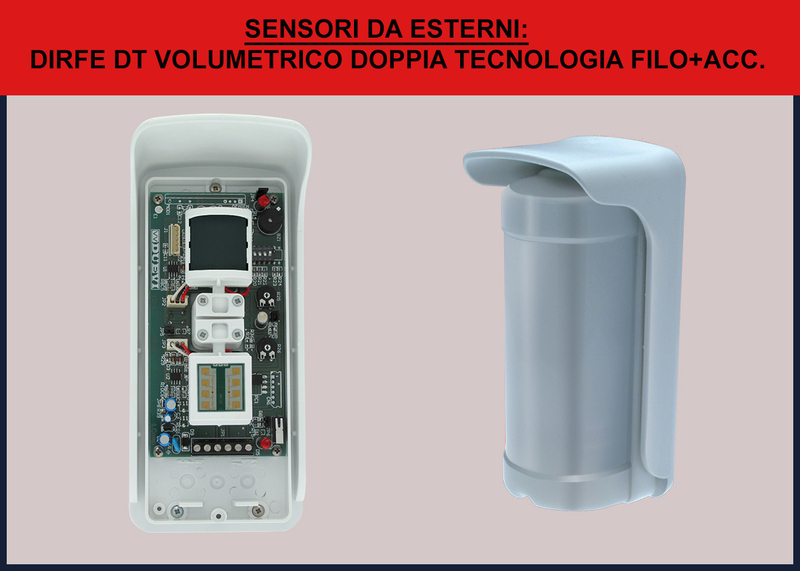 DSF is a battery device, able to control the presence of smoke, given off in the event of fire in the environment in which it is installed. 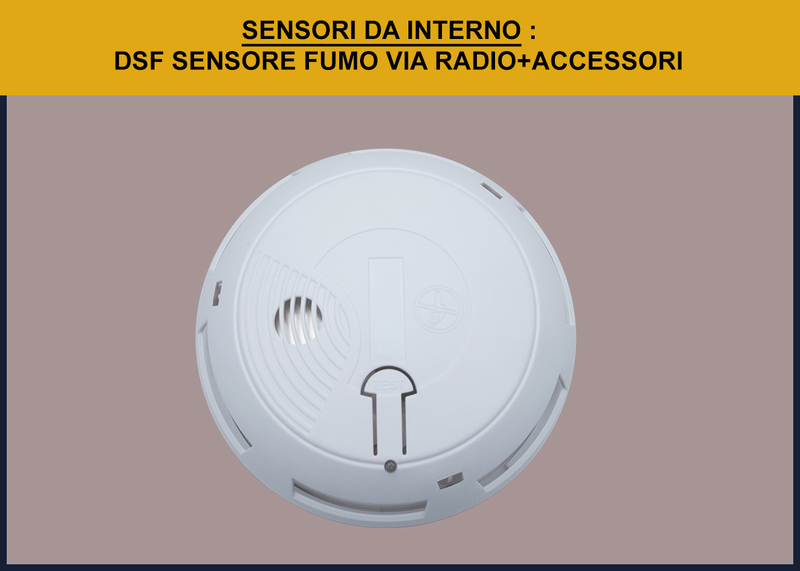 Once detected the presence of smoke, the sensor emits locally a strong warning sound and sends it via radio a 24h reporting to the alarm center. This receiver expands an existing wired system with 10 radio channels divided by 2 relay outputs. Radio receiver 80 radio channels on an LCD display. 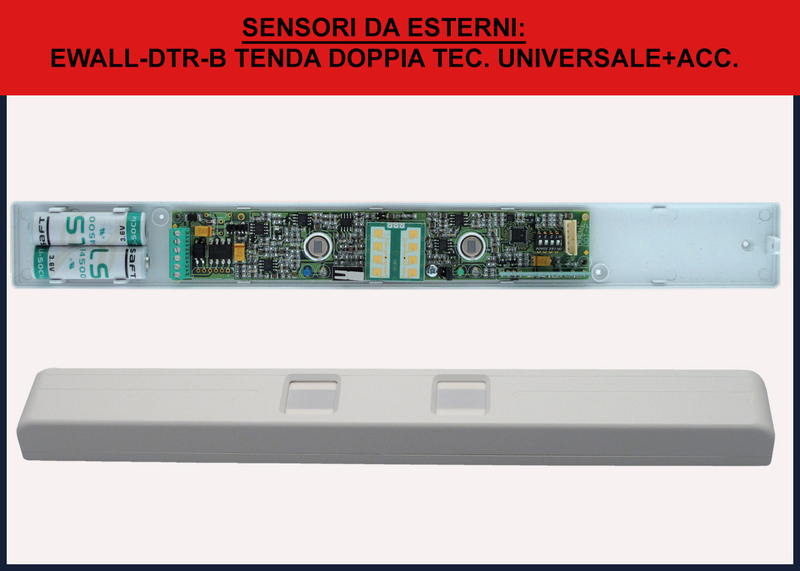 This receiver expands an existing wired alarm system with 80 supervised wireless channels with 8 relays outputs to remember when adding new radio sensors or remote controls DUEVI to the central control unit. The sensors are associated in groups to the various relays outputs (up to 8), which must be connected to inputs of the central row already installed. You can also activate/deactivate the central radio unit by remote control. 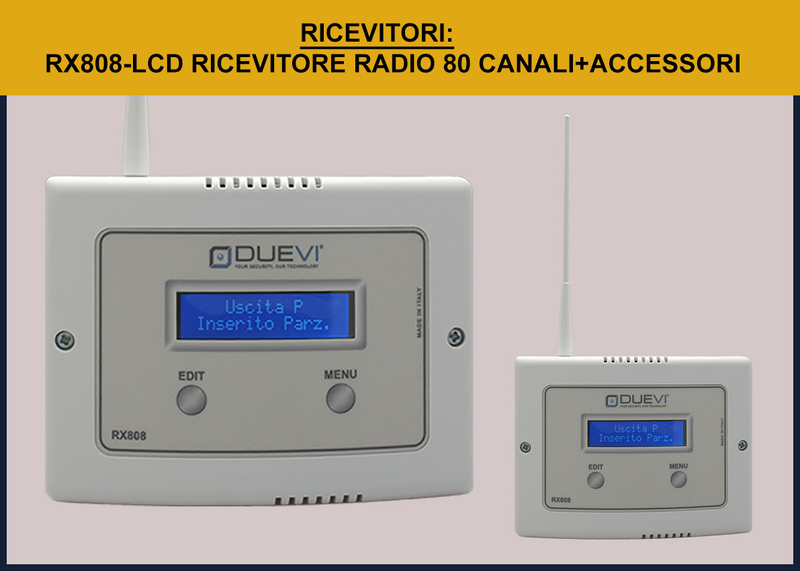 Dimensions: 160 x 120 x 55 mm (without antenna). Radio receiver with voice alerts. 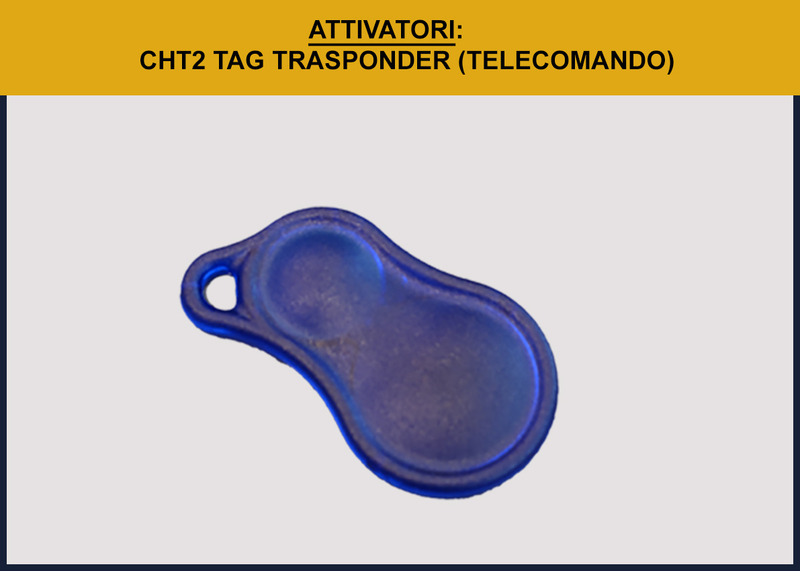 This type of device will emit messages (user registered) every time you receive the code of a radio device, central alarm, motion sensors or remote controls. 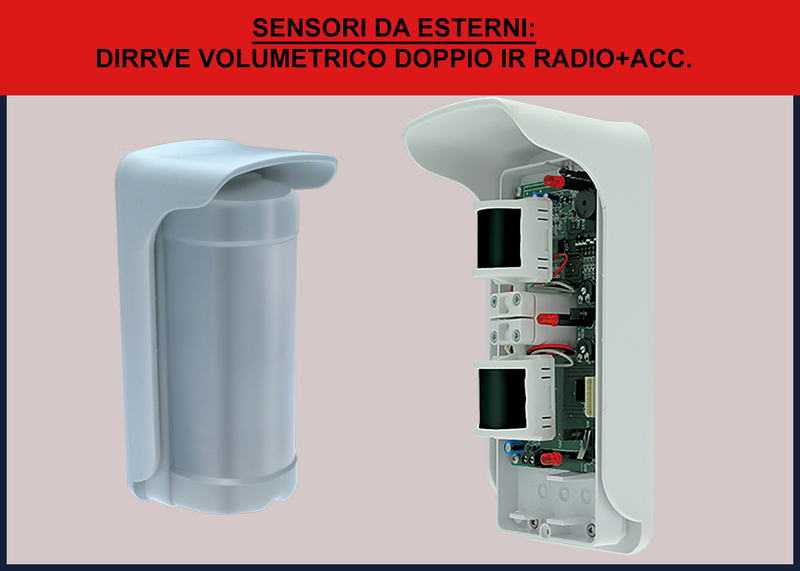 It can be employed, for example, as voice feedback of the control maneuvers of a central, voice alert to a sensor without alarming the central or as voice feedback of a danger sensor (gas, smoke, flood, etc.) or protection in churches, museums, jewelers without alarming the central but vocally identifying the object or the danger area. 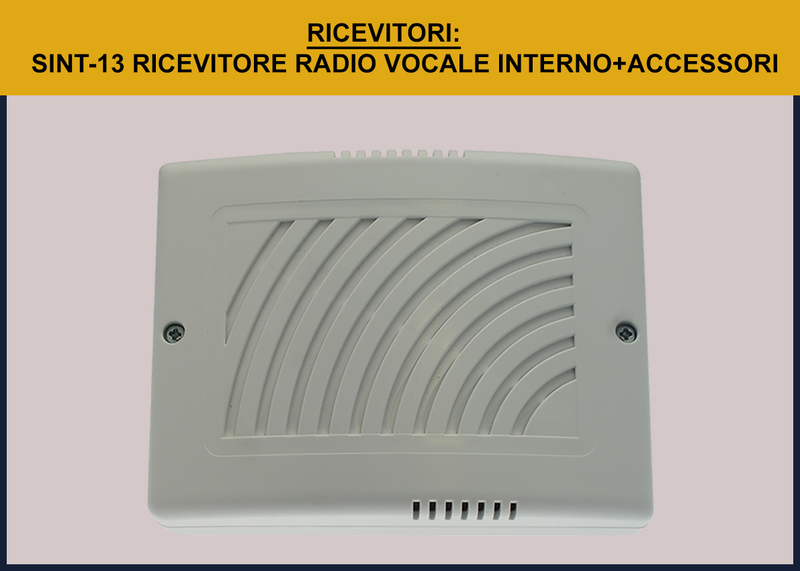 13 vocal messages registration, activation/deactivation radio control/Central. Note: To turn on voice messages is mandatory to use a remote control or a radio control panel. Pre-recorded and customizable 12 SMS messages in case of alarm. 10 pre-recorded voice messages and 12 customizable SMS messages in case of alarm. Dimensions: 160 x 120 x 55 mm. 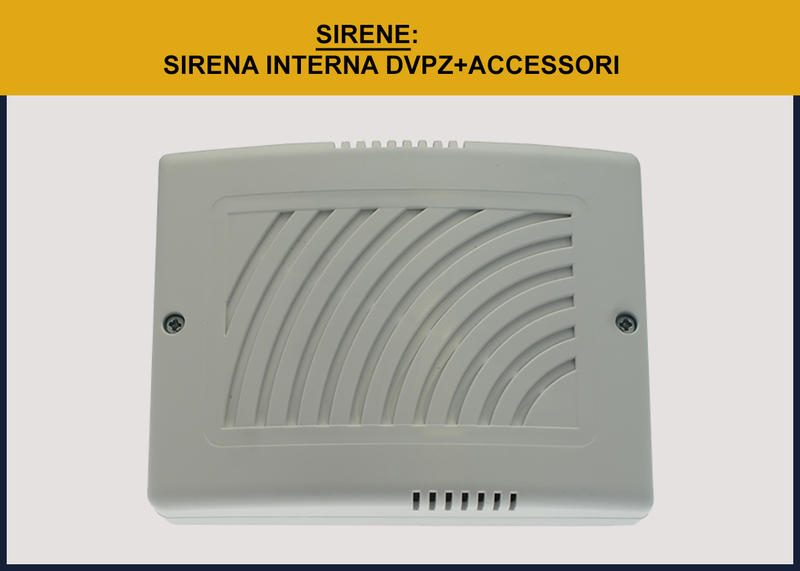 Range detection 12 m, outdoor IP54 protection, excellent versatility and reliability. 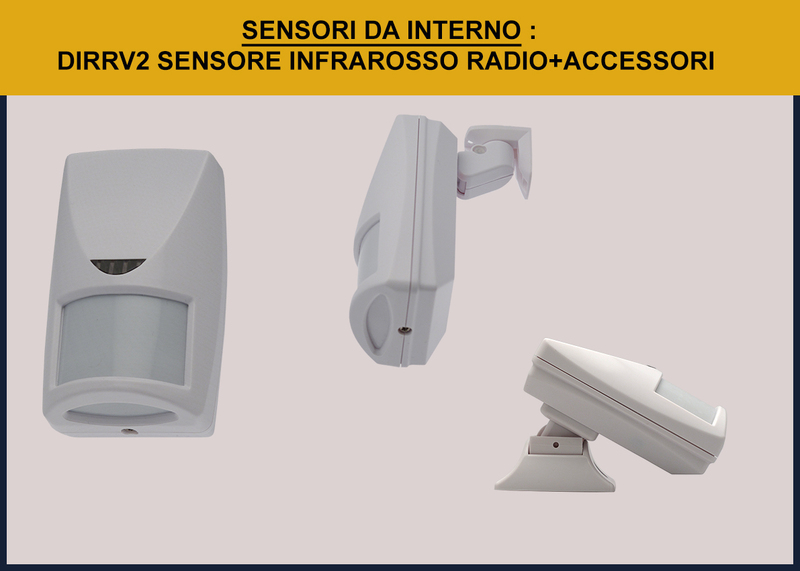 Volumetric sensor outdoor wired, dual technology (passive infrared 1+ 1 1 Microwave 24 GHZ) detection range 12 m, outdoor IP54 protection, 2 swivel sensors, vandal-proof protection IK 10. Mounting height from 1 m to 2.20 m, excellent versatility. 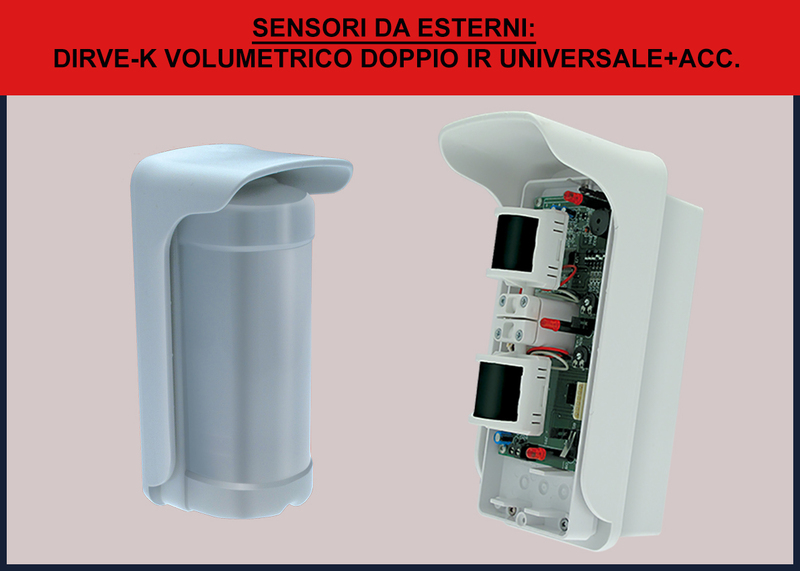 From external volumetric sensor, two sensors mounted on adjustable independent heads, double infrared, mounting height from 1 m to 2.20 m.
Range of 12 m detection, outdoor IP54, vandal-proof IK10 level. 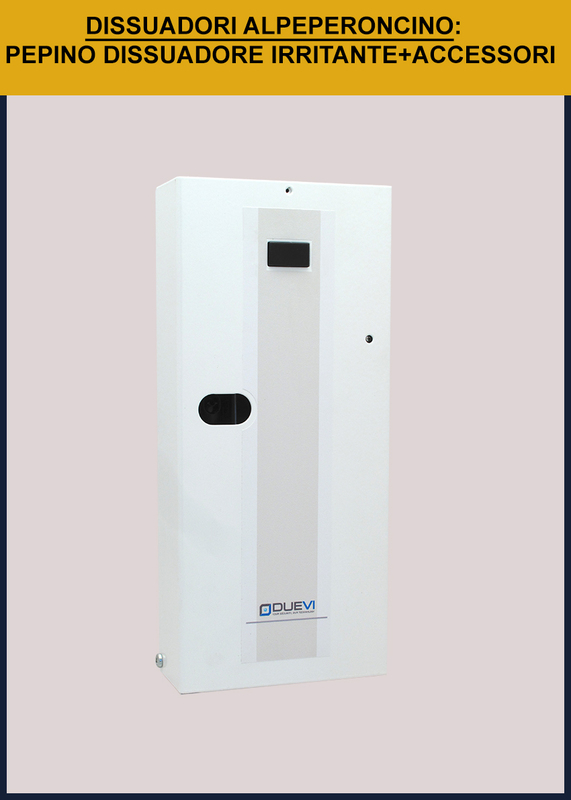 Outdoor double technology volumetric sensor (passive infrared + 24 GHz) microwave mounted on adjustable independent heads. Mounting height from 1 m to 2.20 m, range of 12 m detection, outdoor IP54. 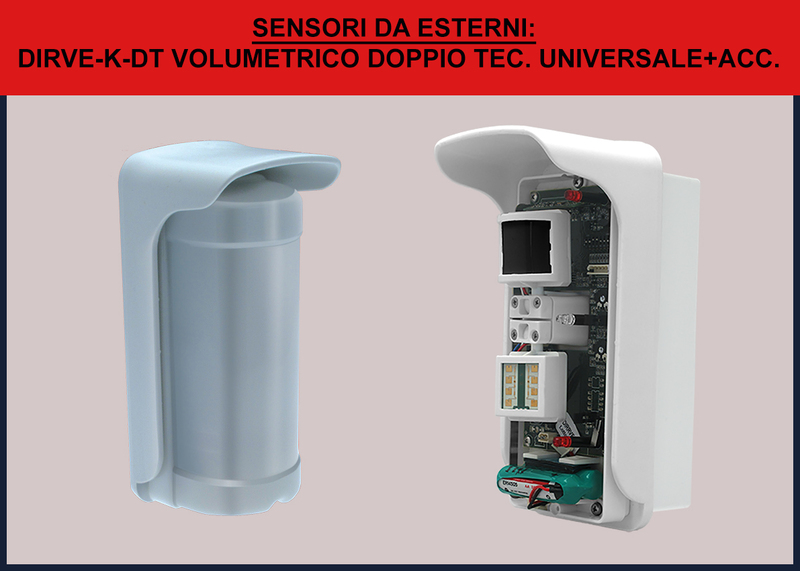 External volumetric universal sensor, two sensors mounted on independent swivel heads, double infrared, mounting height from 1 m to 2.20 m, range of 12 m detection, outdoor IP54, vandal-proof IK10 level. 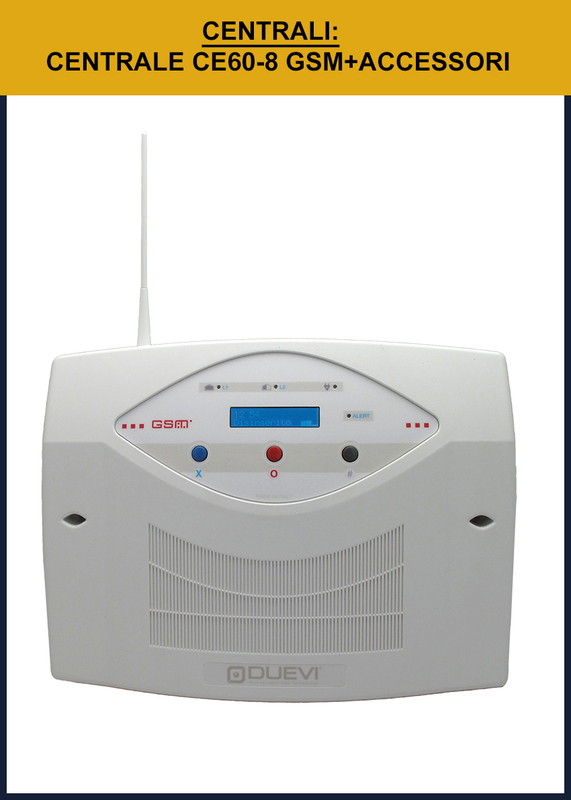 Outdoor volumetric sensor, dual technology (1 passive infrared + 1 24 GHz microwave) on adjustable independent heads. 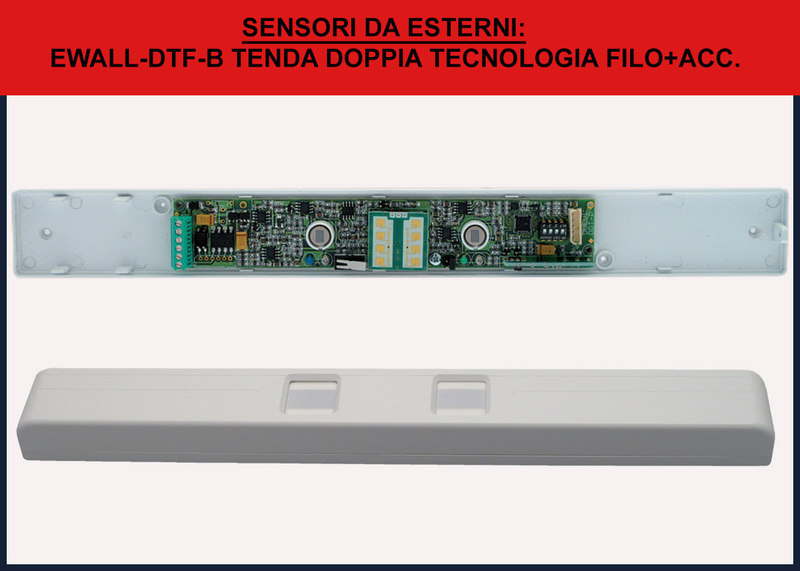 Mounting height from 1 m to 2.20 m, range of 12 m detection, outdoor IP54, vandal-proof IK10 level. 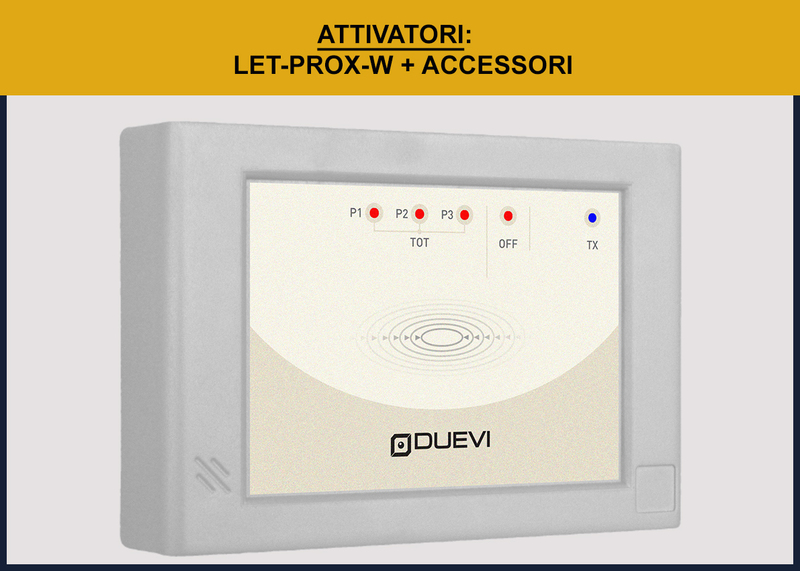 Outdoor protection IP54, vandal-proof IK10 level. Independent alarm signaling for the three sides both via wire that radio. 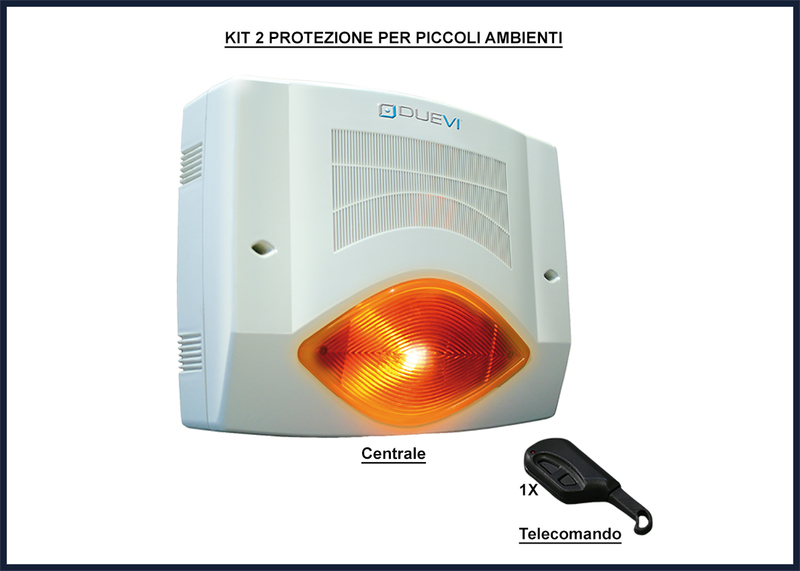 Dual technology (Passive infrared and a microwave transceiver of 2.4 GHZ) designed to generate a detection beam very tight to protect doors and windows. Color version in white or brown. 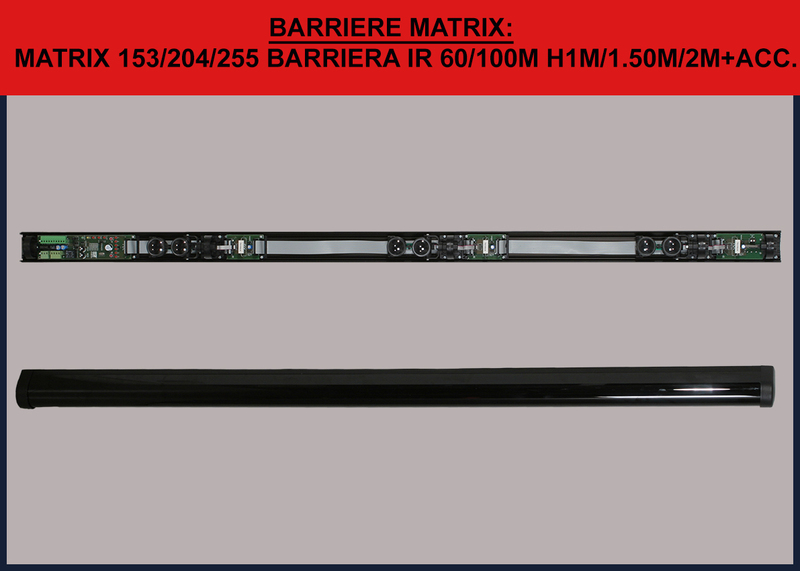 Active infrared barrier 153-DF crossed beams, linear, multiple cross beams, range 100 m, height 1.5 m, with detection of anti-blinding system, positioned at the borders of the property guarantees absolute security, the intruder is detected immediately and triggers the alarm, ideal for properties of medium/large size, warehouses, depots and all that needs absolute security and protection. 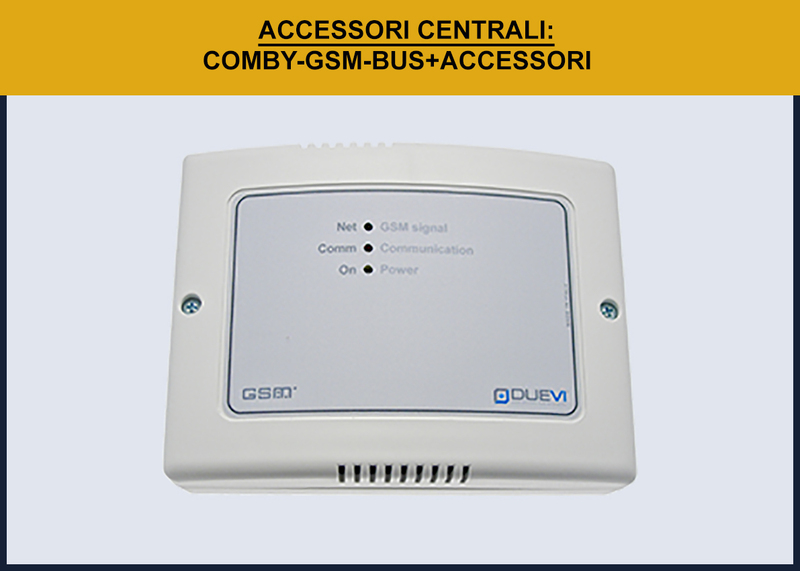 It will be connected to the central control unit, you will be warned with local systems such as lights switching with voice systems, sirens and/or remotely via SMS or downloading our APP via Tablet / Smartphone. For further information, please contact us, we will gradly answer your enquiries. High security professonal active infrared barriers for outdoor use, barriers fed and managed concentrators (Hub) with digital link RS 485 (a hub every 4 couples). 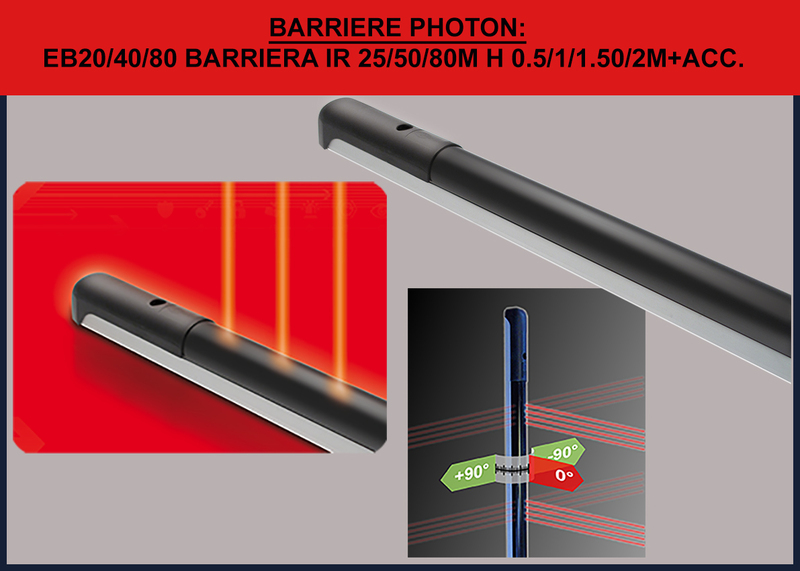 Range 25-50-80 meters outdoors with 70% optical attenuation. Includes wiring test software, setup and monitor barriers functioning. 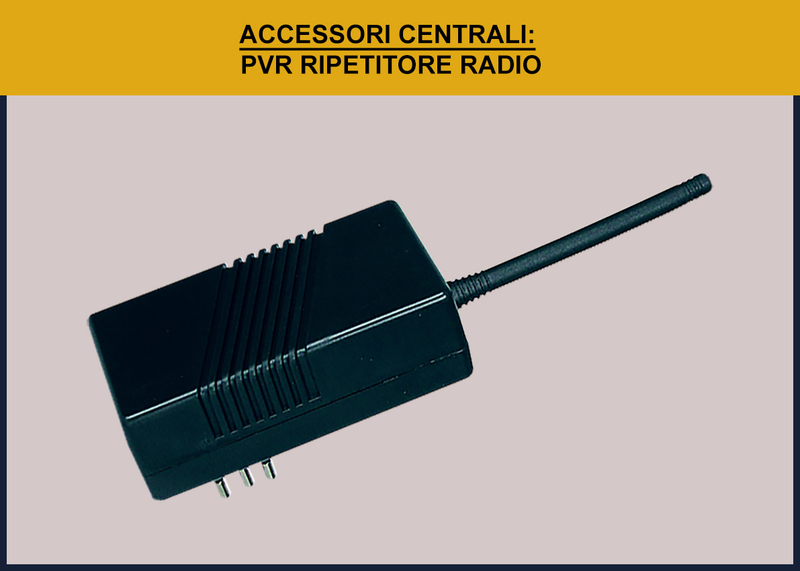 Power 12Dc.- max 200mA per couple. The Photon system ensures maximum protection. The price varies according to the characteristics, for further information, please contact us, we will gradly answer your enquiries.